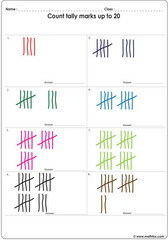 Learn counting tally marks activities for children, count tally marks up to 5, up to 10 and up to 30, Pre-K and Kindergarten. 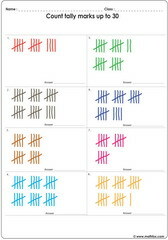 Counting tally marks math worksheets, games, quizzes, tests, PowerPoint games, board games, card games .Resources cover the following topics: count tally marks up to 5, up to 10 and up to 30. Suitable materials on counting exercises for children in the following grades : Pre-K and Kindergarten.